Founded by its namesake Alexander the Great, the city of Alexandria was once ruled by Cleopatra and is amongst Egypt's most historical cities. Whilst many ancient ruins still remain all around Alexandria, it is true to say that you need to know exactly where to look to find the best surviving structures and monuments. Much of Alexandria stands next to the Mediterranean Sea and offers visiting tourists plenty of stunning stretches of coastline and sandy beaches. Since the 1990s, Alexandria has been a city of change, gaining a rather renewed energy and spending huge amounts of money revamping much are the area to promote tourism. With public spaces now full of trees, the opera house fully restored, and the seafront Corniche promenade completely revamped Alexandria has never been so tourist friendly. Particularly notable was the relatively recent opening of the stylish National Museum of Alexandria, which houses a huge amount of information about the city's past. The city of Alexandria contains many must-see tourist attractions, which should not be missed under any circumstances. 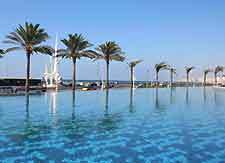 These include the magnificent sweeping Mediterranean beaches - which are a particularly popular alternative to the city's many historic offerings; the Corniche - a lengthy seafront promenade known for its stunning sunsets and food stalls; Kom el Shokafa Catacombs - vast Roman burial grounds which date back around 1,800 years and are spread over three floors; Qaitbey Fort - enjoying an island setting and overlooking much of Alexandria; and the Montazah Palace and Gardens - a particularly attractive royal palace boasting landscaped surrounding gardens with lush planting and numerous palm trees. 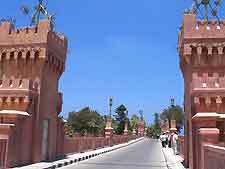 More information about Alexandria Tourist Attractions. Also scattered around Alexandria are many ancient landmarks and buildings of interest. These include the Abu Abbas al-Mursi Mosque - boasting a highly decorated interior, large dome and grand architecture; Caesareum - the remains of a rather splendid temple and full of information about Alexandria's interesting Roman history; New Library of Alexandria - featuring bold contemporary architecture with many impressive features; Pompey's Pillar - an ancient pillar erected in the honour of a past Roman Emperor; Alexandria's Roman Amphitheatre - impressive remains of the only Roman amphitheatre left in the whole of the country; and the underwater monuments - a real treat for scuba divers, who will find many outstanding hidden structures beneath the water's surface. More information about Alexandria Landmarks. Museums are plentiful in Alexandria and house many breathtaking collections. Notable museums and art galleries in Alexandria include the Antiquities Museum - housing more than 1,000 interesting Egyptian artefacts and information about ancient Roman settlements; National Museum of Alexandria - full of ancient treasures spanning many periods, with exhibitions on the city's archaeological underwater excavations; Planetarium Science Centre - part of the New Library of Alexandria and boasting many superb interactive displays and scientific information; Museum of Fine Arts - with many highly acclaimed works of art and must-see sculptures, both past and present; and the Royal Jewellery Museum - located in the Zizinia district and offering many beautiful jewels and rare paintings. More information about Alexandria Museums and Alexandria Art Galleries. 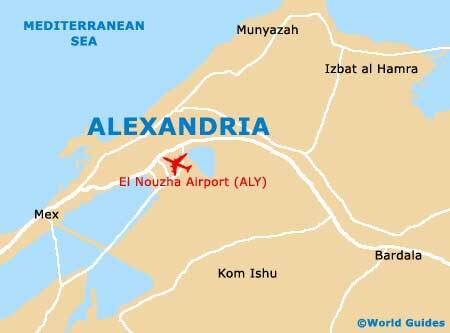 Close to Alexandria you will find countless tourist attractions just waiting to be discovered. Nearby Port Said lies to the east and stands alongside the northern entrance to the Suez Canal, while to the west, El Alamein is known for its enormous Commonwealth War Cemetery. Travel to the south-east and you will find the charms and chaos that is Cairo, Egypt's capital city and home to much more than just pyramids. More information about Alexandria Attractions Nearby.